Lately I have been missing the ocean so much. I’ve watched on TV a documentary about whales and I got a incredible desire for diving. In a bookstore, getting some books for the university, I bought a book by Garcia Marquez called “The Story of a Shipwrecked Sailor”. I got home, sat down the sofa and just left when I had finished the book. It was really good, I could feel the sea. In order to satiate this will of being in the water I decide to spend some weekends diving in Costa Brava. The first place was Lloret de Mar. I got a bus early in the morning to get there with time to do two immersions the same day. On my arrival in Sucre, I caught a taxi with more 3 people to know Tarabuco, 65km distant. Every Sunday this small town has a popular open market. It is crowded with tourists and people walking around and buying. We spend three hours in this town with a strong aboriginal influence. Then we came back to Sucre. I believe that Sucre is one of the richest cities from Bolivia. It was the place where I could see a bigger number of middle class people. 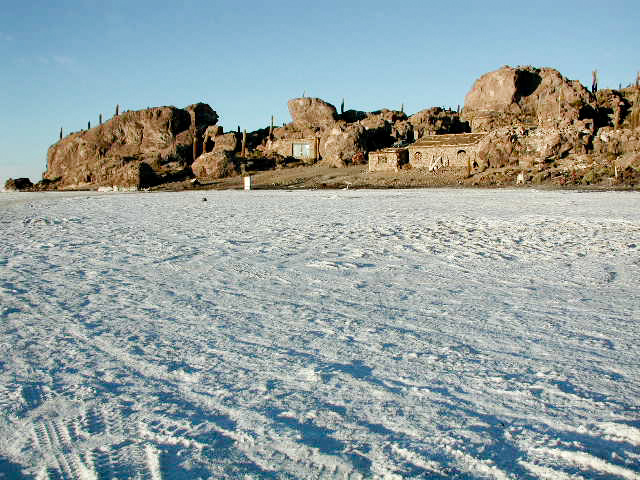 It used to be the town where many Spaniard who explored the mines of Potosí lived. One of the attractions of Sucre is to know the footprints of dinosaurs. These are in a cement factory. The first footprint was discovered 14 years ago, but they had only started to study and preserve the footprints 7 years ago. Tour is well organizing, they have a truck that takes the people to see the footprints in different parts. The guide explains the place very well and speaks an excellent English and Frenchman (a rarity around here).